BBC NEWS | UK | England | Who could shoot a seven-year-old? Who could shoot a seven-year-old? What do you do if someone sees you shoot a man dead? That was the dilemma facing Joel Smith, but in this case that someone was a seven-year-old girl. His conclusion - shoot her too. 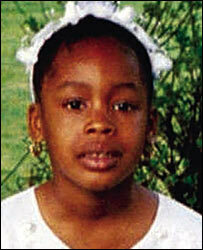 He then left the scene, probably stepping over Toni-Ann Byfield's young body, and has denied it ever since. Now convicted by an Old Bailey jury of a double murder, BBC News looks at what sort of man could do such a thing? Joel Smith, 33, was nothing special - although he liked to think otherwise. He saw himself as a big time dealer yet rode a push bike and carried stolen credit cards. Not the sign of a successful dealer, said investigating officer Det Supt Neil Basu. In fact, his greatest success was to still be alive, he said. Smith was born in London and spent almost 29 years there. He knew little of his father and claimed to have been physically abused as a baby. He spent his teenage years living at 862B Harrow Road in Kensal Green with his mother, coincidentally just doors away from the house where he would later murder the Byfields. By 17, he had committed his first offence, a robbery. This was to be the start of a criminal career that would see him notch up 34 convictions from drugs and firearms offences to violence and robberies. On the streets, he became known as Cocaine or Kane, and was part of a notorious Harlesden gang, the Mus Love Crew. Beneath his surly and muscular physique, Smith was a volatile, arrogant man but with an intelligence that police described as far greater than the average Trident gunman. He was a big talker with an extremely short fuse - always trying to talk his way out of trouble, and sometimes slipping up and talking himself into it. Occasionally he would work as a supervisor on building sites, but his convictions often led to spells in prison. His latest was a three-year sentence for several offences including slashing his mother's boyfriend's throat. Prison though did not seem to deter the drug dealer from taking a significantly more dangerous path towards robbing and shooting other dealers. It was this that led him to knock on Bertram Byfield's door on 13 September 2003 with a ruse of wanting to buy cannabis. Mr Basu has never believed Smith had met Byfield before that fateful day. But Byfield's notoriety as a middle-tier drug dealer would have made it almost inconceivable that Smith would not have known of him, he said. Byfield let him in and the events that followed remain unclear. What is known is that Byfield was shot three times and appeared to have tried to defend himself with a bike. 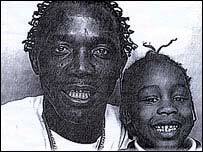 Meanwhile Toni-Ann, who had always thought of Byfield as her father, had been getting ready for bed. She entered the room but tried to run away when she saw what was happening. Smith pulled the trigger and shot her once in the back. Mr Basu called it "a robbery gone wrong". Now the judge must decide the price of this bungle which cost the life of an entirely innocent seven-year-old child.